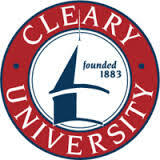 Founded in 1883, Cleary University is shaped for tomorrow's business needs; built in the image of today's most forward-thinking companies. Innovative surroundings. Motivated students. Networked professionals. Small, intimate classes that move students forward quickly. Professors who come directly from the boardroom to teach right here in our classrooms. If you're ready for a life in business, there is no better place to prepare. We have taken business school to business school, reinventing it to make it smarter, more effective, and more relevant. Whether you are an undergrad preparing for a life in business or a professional looking for a major leg up, we're ready for you.